The first in a series of DC Comics Gotham City Sirens Statues has been revealed by Sideshow Collectibles. These new statues will be designed by artist Stanley ‘Artgerm’ Lau. This Artist Series will include Catwoman, Harley Quinn and Poison Ivy. 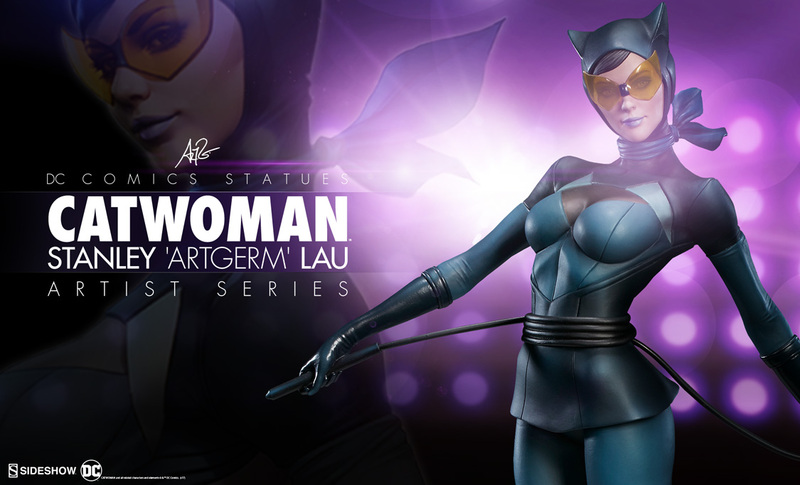 First up is Catwoman with a new preview of the Stanley Lau designed statue. Pre-orders for Catwoman begin on Thursday, March 9, 2017. Look for more details and additional photos to be released early next week. Click the banner for the full size preview. That Catwoman design is hideous. She looks like a Tekken reject. I love Catwoman and it's a nice statue sure but wow do I not like that design. Kind of reminds of Jun from Gatchaman. Probably due to "skirt" and strange yellow visors. Where did they get this design from? I like it a lot. Can't wait to se the Ivy and Harley. Big fan of Artgerm. I like that it's a different take...not sure I'd buy it though. Selina Kyle gives up her life of crime in order to pursue a career in figure skating.